The practice of drinking reishi mushroom tea has existed for years, and it's still one of the best ways to reap the benefits of this medicinal mushroom. The reishi mushroom (Ganoderma lucidum and other species) is a polypore that is cultivated on logs or woodchip beds. Although softer when fresh, it becomes quite hard when dried. This is due to the presence of chitin, a carbohydrate that helps makes up the cell walls of fungi. How does this affect your mushroom tea? It means that dried reishi is tough, with some of the medicinal molecules locked up in the indigestible chitin. So we're going to need a long hot water extract to get these molecules out, far longer than you would brew a traditional tea. For this recipe I recommend buying your dried reishi mushrooms from Mountain Rose Herbs! Read my review of the company here. What!? You don't like it? A sweetener such as honey. Don't add too much refined sugar or you defeat the purpose of creating a healthy drink. Stomach upset and allergic reactions are rare but they can happen. Only try a small amount of tea your first time to make sure it agrees with you. Do not take if you're on blood-thinning medications as this tea may increase bleeding time. Your tea will keep for a few days in the refrigerator, so feel free to make a few batches at a time and store them. 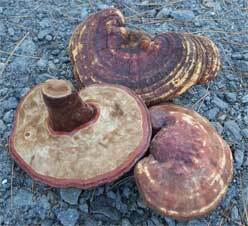 Reishi mushrooms also have an anti-inflammatory effect. However, those benefits come from an alcohol extraction, not water. 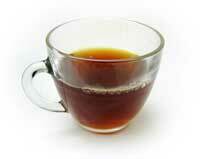 To reduce inflammation, it's better to make an alcoholic Ganoderma extract than a tea. For more information on the health benefits of reishi along with documentation of many clinical studies, I'd recommend reading Reishi Mushroom: Herb of Spiritual Potency and Medicinal Wonder by Terry Willard. Ganoderma lucidum is one of the best studied and best used substances in herbal medicine. Yet there is a lot of hype around reishi. Use this recipe with some quality organic mushrooms from a good supplier. You don't need to spend a small fortune! Note that this mushroom tea recipe also works for other tough medicinal mushrooms such as the true tinder polypore (Fomitopsis officinalis) and the artist's conk (Ganoderma applanatum).